A trip to Gettsyburg can make people ask some big questions: What is courage? How do we define freedom? What role did the Founding Fathers intend for Federal Government? And, most importantly, where did Abraham Lincoln plant his big feet when he delivered The Gettysburg Address? On November 19, 1863, Cemetery Hill was as crowded as it had been 4 months earlier, and probably just as chaotic. Soldiers’ National Cemetery was just being dug, the battlefield still offered up corpses, the town was rebuilding, and Union spirit was at a fever pitch. And who in that mob knew that they were about to hear one of the most famous speeches in history? "Ah cain't see 'im. How 'bout you boys?" In the words of Lincoln’s secretary, John Hay, “The President, in a fine, free way, with more grace than is his wont, said his half dozen words of consecration, and the music wailed and we went home through crowded and cheering streets.” The exact coordinates of where the President had stood would not, could not, have been noted. 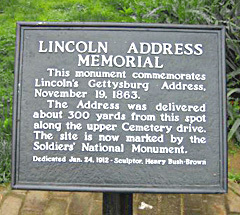 But the search for the exact spot would soon begin with Grail-like intensity, a quest detailed by Garry Wills in his book, Lincoln At Gettysburg: The Words That Remade America. It starts with W. Y. Selleck, a member of the committee charged with designing the Soldiers’ National Monument in 1864. Selleck claimed the spot where Lincoln delivered the address “was 12 ft. wide and 20 ft. long, and facing to the North West. It was located 40 ft. North East of the outer circle of Soldiers Graves…” This became known as the Selleck site, and its veracity was supported for a hundred years. Then, in 1973, a retired park historian named Frederick Tilberg published a “strenuous refutation of it,” placing the exact spot at twenty-five feet below the Selleck site. Harrison took the two key photographs of the crowd in the cemetery—one taken facing the Evergreen Cemetery gateway, the other taken from the second story of that gatehouse—and tried to align every identifiable feature in the pictures with remaining features…Harrison went out with an associate (now her husband) to photograph the scene on a late-November day, with atmospheric conditions and foliage roughly the same as in the original photographs. Wills says that “since she has not published her own case for the site, there has not been a debate that would give it a name,” so he christens it “the Harrison site.” The new site “seems securely established…At least one small battle of Gettysburg has, finally, been won.” Supposedly one could go stand on it, and commune with the sweep of history and Lincoln’s timeless egalitarian rhetoric, but there’s a flag pole there. Clearly, finding the general vicinity of the Address was not an option. On a 6000-acre battlefield that is at once a massive pergus and a veritable Venn Diagram of intersecting hot spots, this one burned brightly. But why? Part of it must have to do with the personal nature of the Address itself. At 278 words, and clocking in at around 3 minutes, it is a speech we can relate to, one we could have made ourselves in a high school communications class. This brevity also gave rise to a story—since disproved, alas—that the Address was scribbled on the back of an envelope, as homely a piece of stationary as we can imagine. Who has not held a battered and torn envelope in her hands? It all feels more familiar to us than the battle itself. How many people, though, care where Edward Everett was? After all, his 2 hour Funeral Oration was the main event of the day, and garnered almost all of the attention. (“Mr. Everett,” wrote Hay, “spoke as he always does, perfectly.”) But Everett’s speech today seems as elegant—and as relevant—as a rusty smoothbore musket. Full of Greek and Roman allusions, paeans to martial valor, and evocations of well-trodden stories from Western history, the speech is now of little concern to anyone except students of 19th Century rhetoric. Perhaps the urge to find the exact spot of the Address simply comes from the magnetic pull of the person who stood there, from the need to find the man in the myth. 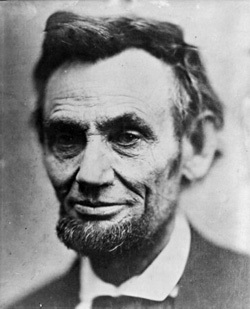 Loved or loathed, angel or devil, Lincoln fascinates. Despite the 2 centuries since his death, and despite the fact that all of his writings can be found at the push of a button (and what better way to get to know someone? ), standing in Lincoln’s footsteps offers visitors a physical connection that they could net get anywhere else, not even at his tomb, no matter how well preserved the body is rumored to be. Certainly, people study the battle and visit the field to learn history and ask the ‘big questions’. But they also go to Gettysburg to find other people. Which might be why the number one tourist industry there is ghost hunting. And why Kathleen George Harrison married her partner in the search for the Lincoln Pergus.